Summer has arrived and with it comes a whirl of activity. With the kids out of school and social events packing your calendar, it can be a hectic time of year. One place that tends to suffer during the summer months is your home. With people coming and going and nonstop fun, your house can wind up looking like a cyclone whirled through. 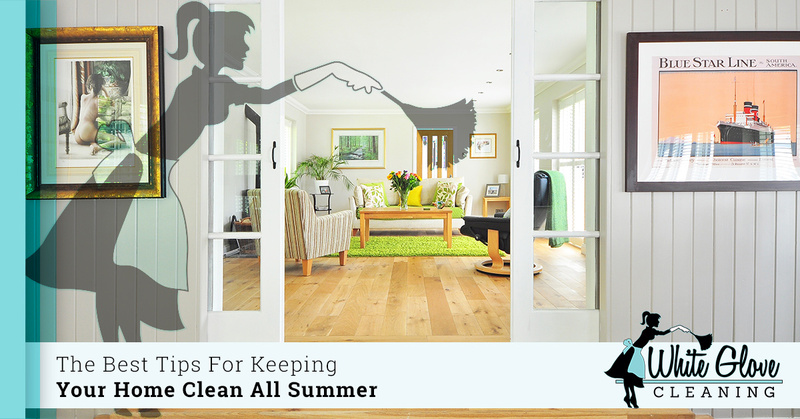 If you want to ensure your home retains its sparkle and shine this summer season, check out our best tips for keeping your home clean all summer long. When it comes to keeping your home clean, it is more than a one-person job. If you have kids or other people living in your home, make sure you get everyone on board with keeping the home clean. Make sure everyone is on the same page and who is responsible for what. For youngsters, create a summer chore chart and ensure they are pitching in. Even small tasks like tidying up a room and sweeping the kitchen will go a lo06ng way in preventing your home from becoming a disaster. During the summer, it is super common to entertain guests and throw house parties. If you do throw a big event, make sure you handle cleanup after the party right away. While it can be tempting to keep ignoring those piles of dishes and dirt tracked all throughout your home, the longer you leave the mess, the worse it will build up. When you plan a party, carve out time in your schedule the next day to dedicate to cleaning. Block off a couple hours that can only be spent on putting the house back together. This will save you from winding up with party plates littering your home weeks after the event is over. The best way to prevent your home from turning into an overwhelming mess is to choose one day a week that you dedicate to cleaning the home. Perhaps Sunday afternoons you can set aside a few hours to go from room to room getting rid of clutter, putting things away, and deep cleaning. When you dedicate one day a week to cleaning, you ensure that important tasks, such as dusting, vacuuming, and sweeping are not procrastinated for too long. Let’s face it, the summer is a busy season! If you find that you simply do not have the time to clean your home during the summertime months, don’t hesitate to reach out to the pros. We provide top-notch cleaning services to Spokane Valley and we can help you keep your home sparkling clean during your busy summer. Our housekeeping services will ensure that the burden is lifted from your shoulders and that you have more time to enjoy summertime fun. From kitchen cleaning to bathroom cleaning, we handle it all. Reach out to our team today to learn more about how White Glove Cleaning can assist you with keeping your home beautiful.